Papers: 1924-1987, approximately 951.5 linear feet. 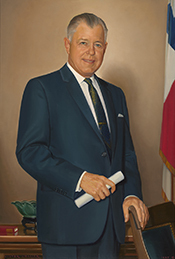 The papers of W.R. "Bob" Poage document his service in the Texas Legislature and in the U.S. House of Representatives. While the bulk of the papers are from W.R. Poage's congressional years, 1937 to 1978, there are also materials dealing with his life as a Texas State Senator in the 1930s and in retirement in the 1980s. The massive congressional papers contain the usual government files for agencies, commissions, departments, committees, legislation, correspondence, and case files, both civilian and military. Of particular interest are W.R. Poage's files while he served as a member and chairman on the House Agriculture Committee. Other files cover government agencies, such as the Rural Electrification Administration and the Brazos River Authority. The papers also include travel files and diaries, speeches, card files, biographical materials, photographs, media, awards, and maps. There are also materials documenting information concerning W.R. Poage's family, the death of his wife, guest books, inaugural invitations, recordings, and historic newspapers. A finding aid for the papers is available in the repository and online. Papers: In the Hyde Murray Papers, 1947-1984, approximately 127 linear feet. Subjects covered in the papers include W.R. "Bob" Poage. A finding aid is available in the repository and online. Oral History: August 21, 1971-December 22, 1983; 5 volumes. The oral history interviews of W.R. Poage were conducted between 1971 and 1983 for the Waco and McLennan County Project for the Baylor University Institute for Oral History. The extensive interviews cover W.R. Poage's personal life, his career in the Texas legislature, and in the U.S. House of Representatives. An abstract of the interviews is available in the repository and online. Oral History: August 21, 1971-December 22, 1983; 5 volumes. The oral history interviews of W.R. Poage were conducted between 1971 and 1983 for the Waco and McLennan County Project for the Baylor University Institute for Oral History. The extensive interviews cover W.R. Poage's personal life, his career in the Texas legislature, and in the U.S. House of Representatives. An abstract of the interviews is available at Baylor University and online. Oral History: Oral history interviews of Lawrence F. O'Brien and Wilbur D. Mills include references to W.R. "Bob" Poage. The transcripts for the interviews are available in the library and online. Oral History: In the Bruce J. Dierenfield Interview, 1975-1984, 24 cassettes. The oral history interview includes references to W.R. "Bob" Poage. Ralph Nader Congress Project. Citizens Look at Congress: W. R. Poage, Democratic Representative from Texas. Washington, D. C.: Grossman Publishers, 1972.